Indonesia has a sweet tooth. Syrupy snacks and cakes are hugely popular, and it can be challenging to order a cup of tea or coffee without it being liberally dosed with sugar. I’ve been asked, somewhat incredulously: “Apakah Anda benar mau minum kopi tanpa rasa?” (“Do you really want to drink coffee without flavour?) Even ‘plain’ bread is likely to be sweetened. Across the country there are 1.3 million families engaged in sugar cane cultivation, and 63 operational sugar mills (most of which are over 100 years old). But local production accounts for less than half of the mountain of sugar consumed. The rest is imported. The ‘average’ Indonesian consumes around 25kg of refined sugar per year. So imagine a big white mountain containing 5.7 million tonnes of sugar – that’s how much Indonesians are forecast to consume this year. But despite Indonesia’s reputation as a nation of sugar-lovers, it might (or might not!) be surprising to find that the Australian per capita consumption is 50% higher than Indonesia’s – and that the US average is even higher again. In fact, Indonesian consumption is actually close to the worldwide average – if still higher than the World Health Organisation’s ‘recommended’ maximum consumption of 18kg. However, in Indonesia, cane sugar is only part of the story. Sugarcane plantations have only existed since the Dutch colonial time. 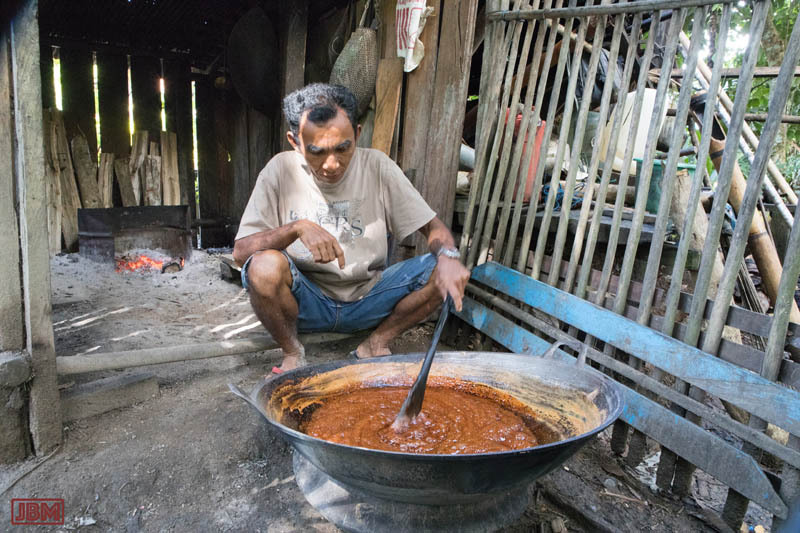 Prior to then, and continuing to the present day, Indonesians produced a variety of palm sugars, usually collectively referred to as ‘gula merah’ (red sugar). 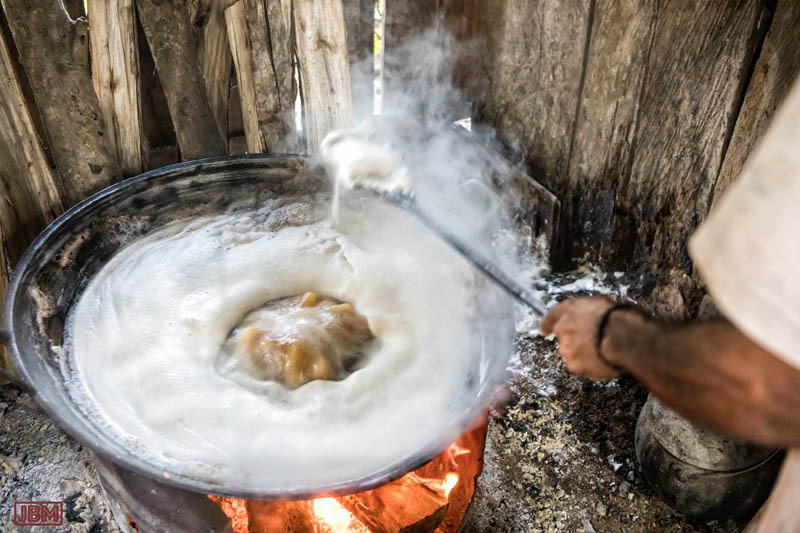 Palm sugar can be made from the sap of Nipa palms (Nypa frutican), Toddy (or Lontar) palms (Borassus flabellifer) or, most commonly, from the Coconut palm (Cocos nucifera). Coconut palm sugar is known locally as gula kelapa or gula jawa. It is sometimes sold as a blend of the genuine palm sugar and (cheaper) cane sugar. The best quality palm sugar is derived from the sap of the Aren palm (Arenga pinnata). This sugar (gula aren) is regarded as more fragrant and richer than gula kelapa – and it is both less common and more expensive. 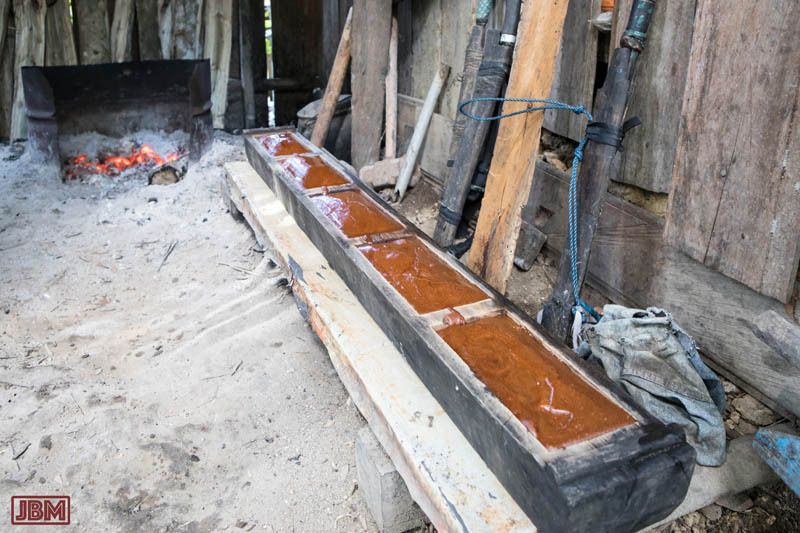 We were fortunate to witness the whole process of making gula aren while staying in Kedang Ipil, a village a few hours’ by road west of Samarinda, in Kutai Kartnegara, East Kalimantan. We were taken there by our wonderful and indefatigable guide Innal Rahman. Pak Hairo has ten mature Aren palms. 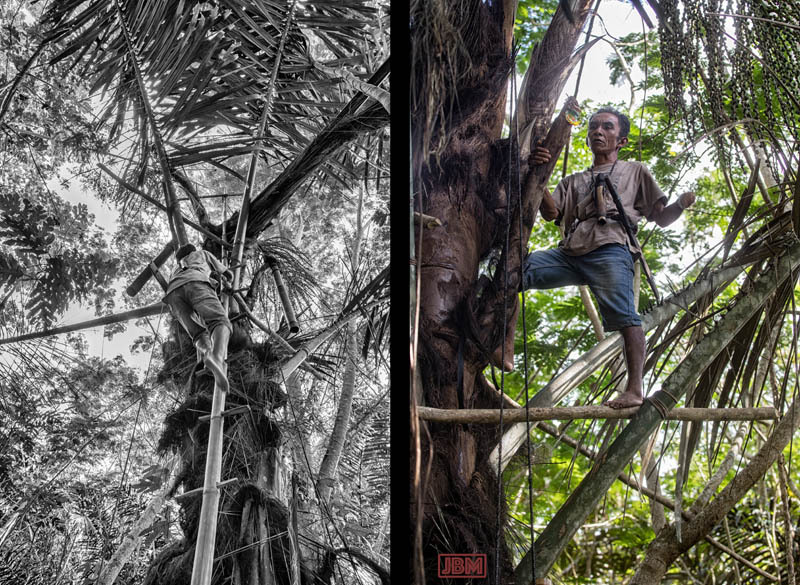 He ‘owns’ them – but not the land that they grow on – with his exclusive right to tap them indicated by the bamboo ladders that he built to climb up each one. 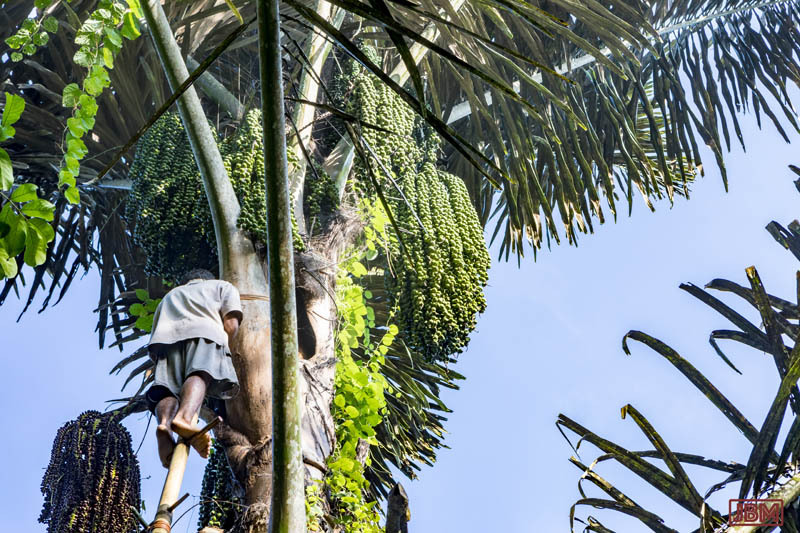 For the people of Kedang Ipil, it’s a valuable plant; the young fruit can also be eaten, and the fibrous material of the trunk is widely employed as a roofing material. The palms are scattered around the forest which surrounds the village, as – unlike the much-maligned African Oil Palm (Elaeis guineensis) – the Aren palm is not well suited to plantation cultivation, preferring to grow in mixed forests. 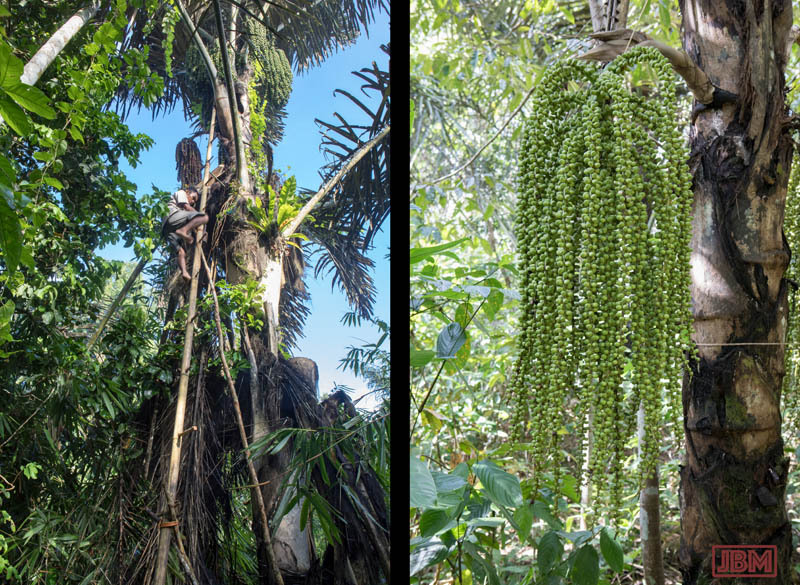 They grow to over 20 metres tall, and begin to produce flower stems, from which the sweet sap is obtained, after 10-15 years. 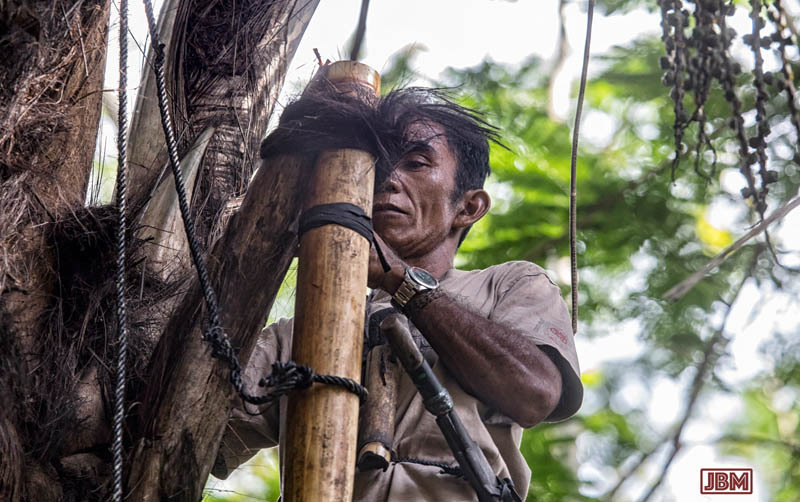 Pak Hairo collects the sap twice daily (at around 6:00am and 4:00pm) from those Aren palms that are currently in production, using a 2 metre length of bamboo to capture the sap. 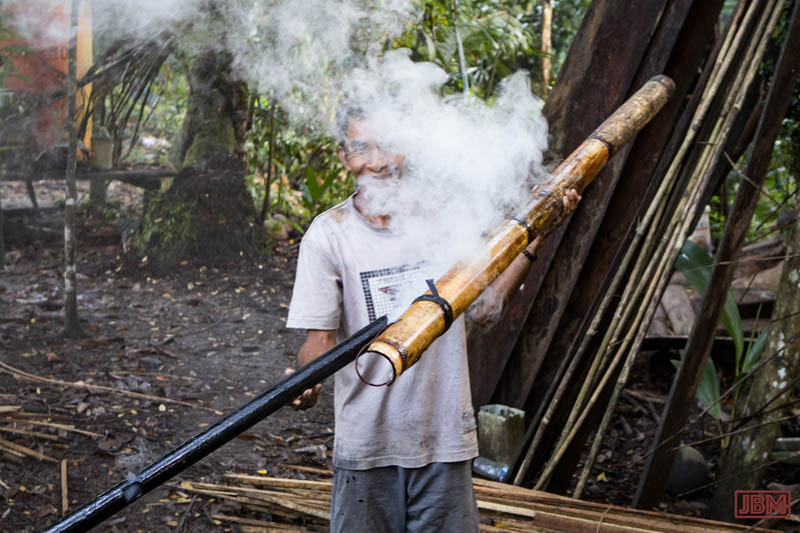 Before each use of the bamboo, he goes through an elaborate process of cleaning the inside of the bamboo with hot smoke. 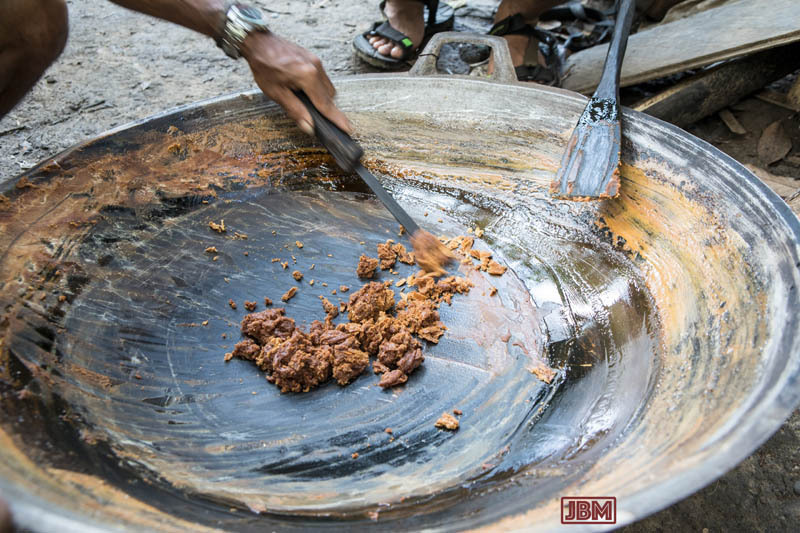 This ensures that the surface is clean and free of bacteria, so that the sweet sap won’t begin to ferment before it can be rendered down to make blocks of gula aren. 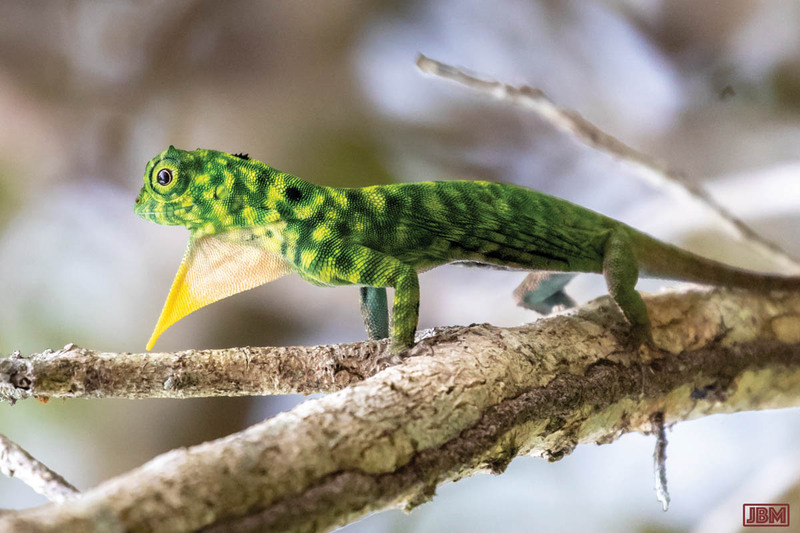 Once in the forest, he climbs up a precariously balanced ladder to the fruiting branch, carrying an empty length of bamboo, and the special sharp knife he uses to make incisions to release the sap. 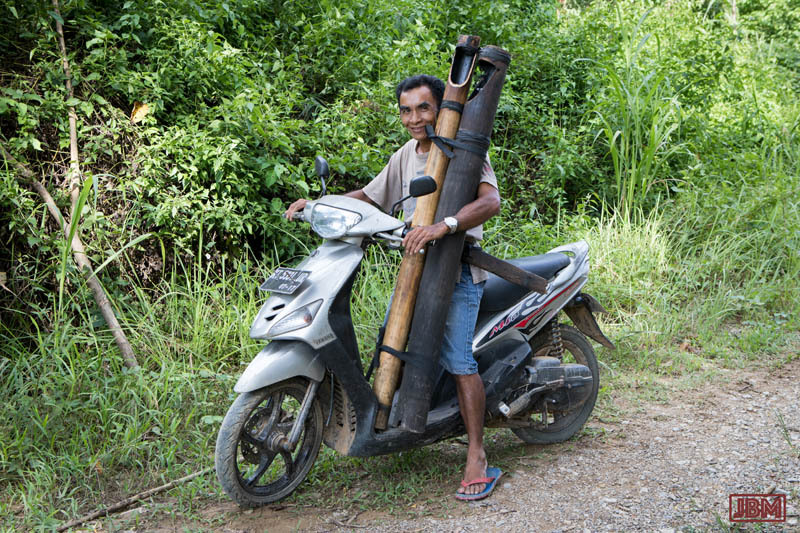 He removes the full (and now very heavy) bamboo from his previous visit, and then a new incision is made – with great care. The cut must be made at just the right and angle and depth; if not, less sap will be released, and the productive time of the flower stem – which can up to six months – will be reduced. 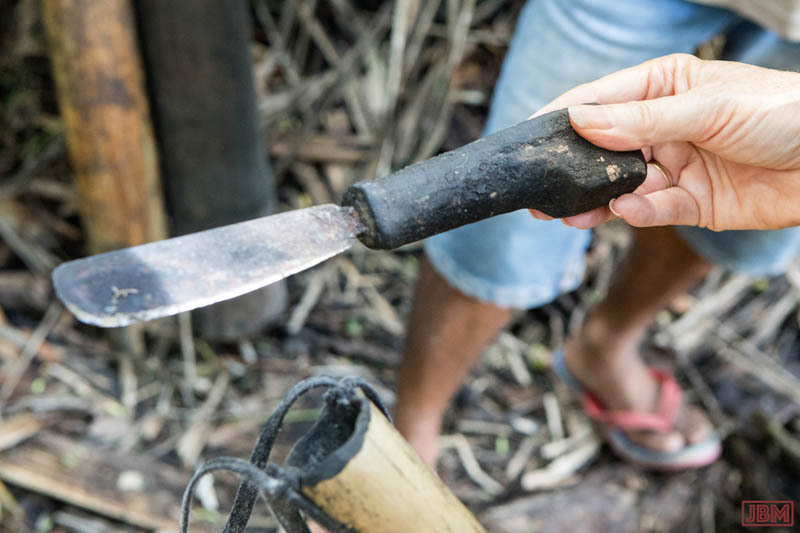 Once the new bamboo is in place, he can return home to commence converting the sap into gula aren. 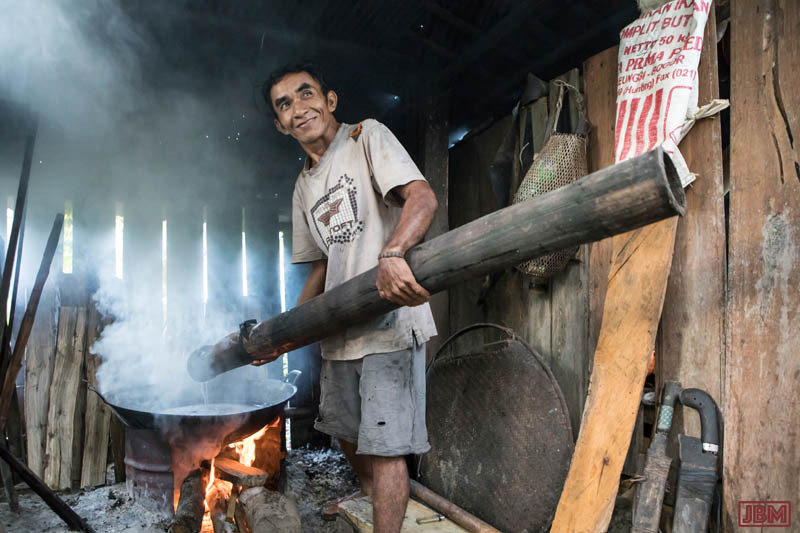 The harvested sap is emptied into a large wok-shaped cooker, placed over a small fire. The fire can’t be allowed to get too hot, or else the gula aren will become black, burnt and unpalatable. The cooking process takes about two hours, during which time the brew must be stirred very regularly so as cook evenly. The process is complete when the mixture becomes very viscous, dark red and bubbling thickly. 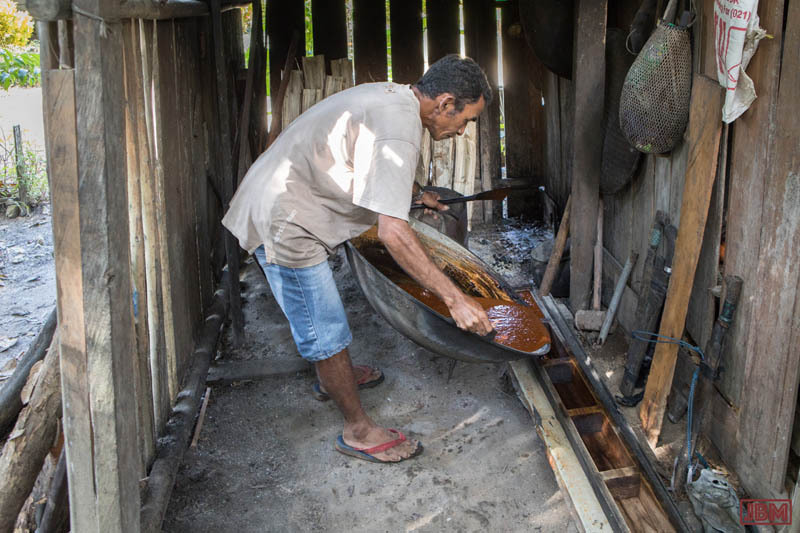 He pours the still-liquid gula aren into moulds cut into a length of timber, and leaves it to cool and solidify. We enjoyed tasting the left-over bits that remained in the cooking pot. They were truly delicious! 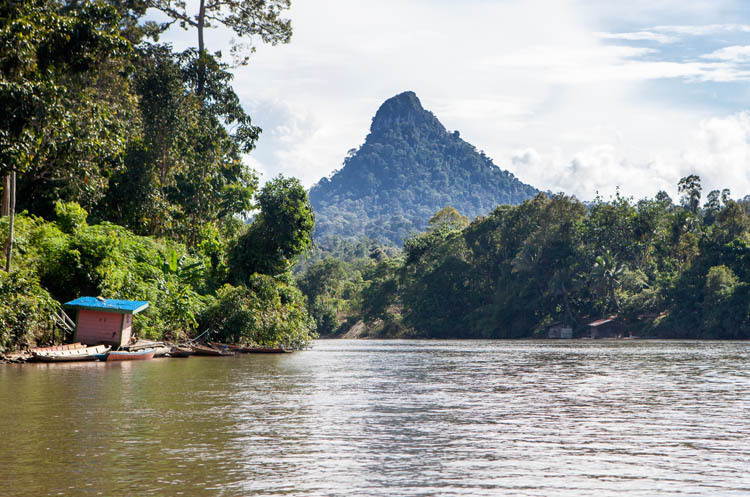 The Mahakam River runs right across the province of Kalimantan Timur, from the Muller Mountains of Central Borneo to the east coast, downstream of Samarinda. 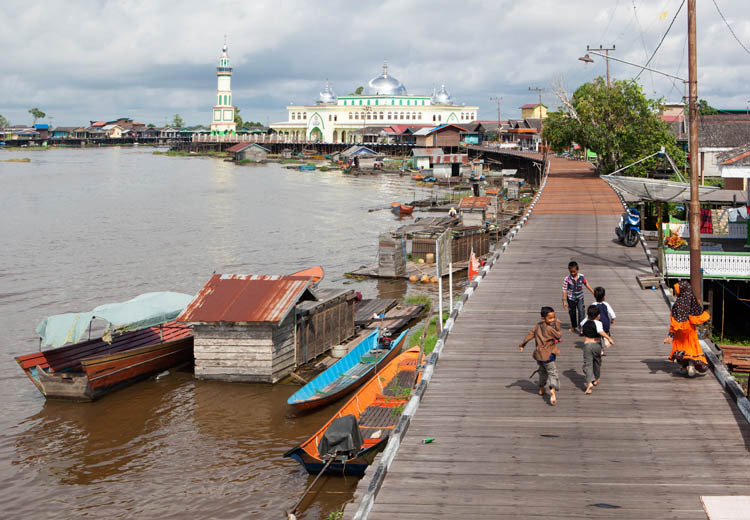 At 980km, it’s the second longest river in Indonesia (after the Kapuas in Kalimantan Barat). The Sultanate of Kutai Kartanegara ruled over most of the Mahakam River basin from its establishment in 1300 AD. Then came waves of disruption in the form of the Dutch, independence, and trans-migration. 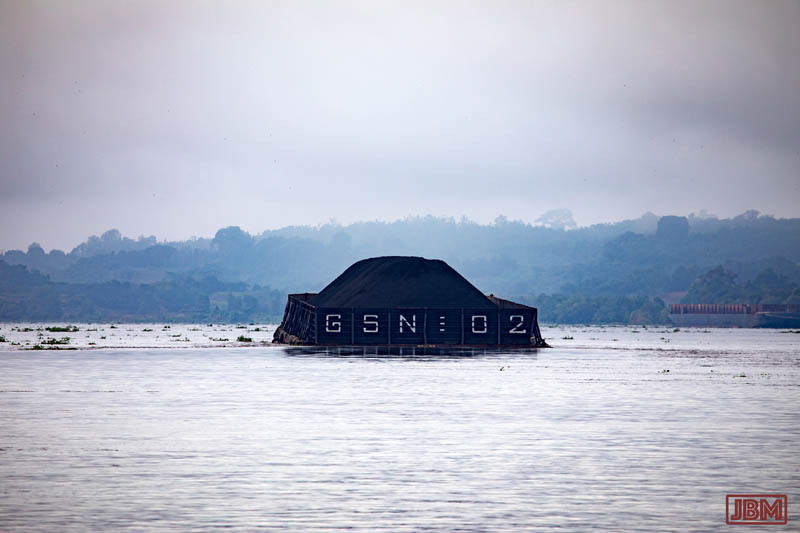 There is still a Sultan at the palace in Tenggarong – but nowadays on the Mahakam, coal is king. There ís a lot of traffic on the Mahakam which is still, despite construction of lots of roads, a major highway into ‘The Interior’. And a lot of that traffic consists of coal barges. During one recent four-day trip up the river, we must have seen a hundred of them. 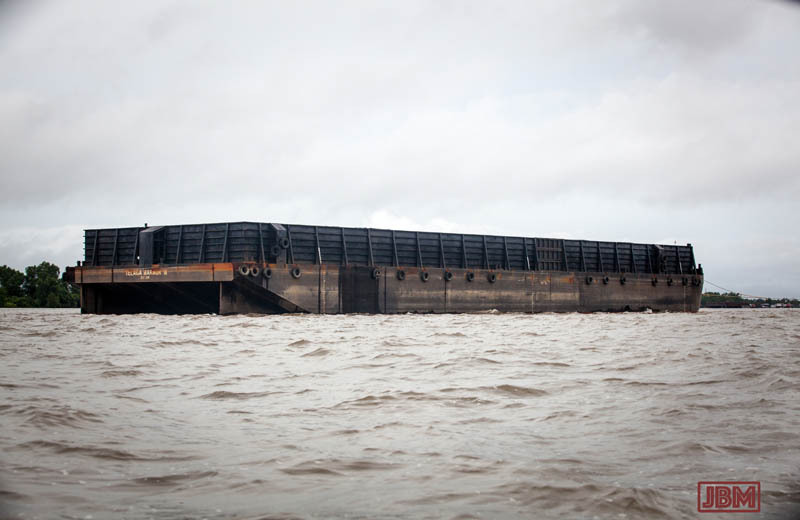 Huge floating steel trays, each one hauled behind a large tugboat. 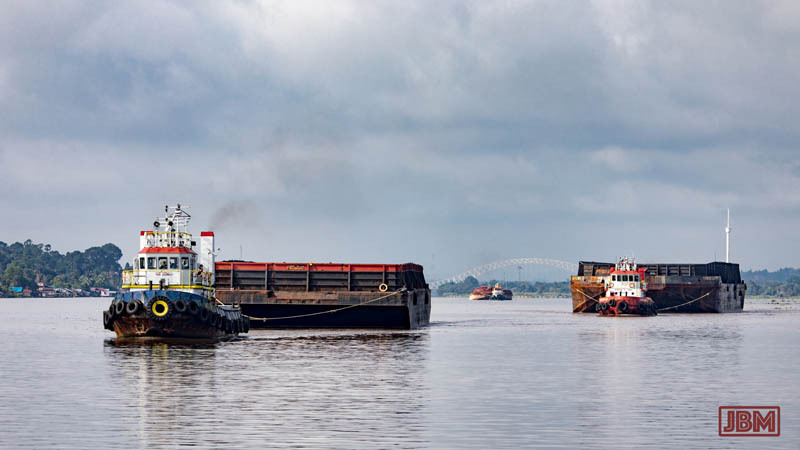 Full barges, low in the water, heading downstream, and empty ones returning back upstream to be refilled. 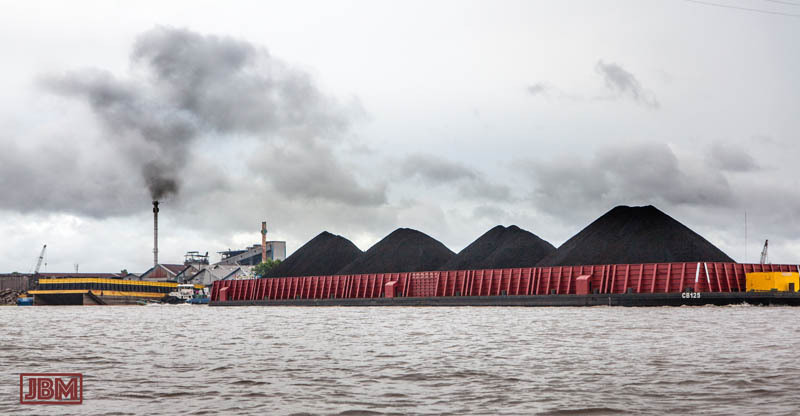 The mining companies truck the coal to the river, where it gets crushed, stockpiled, and then loaded onto the barges. 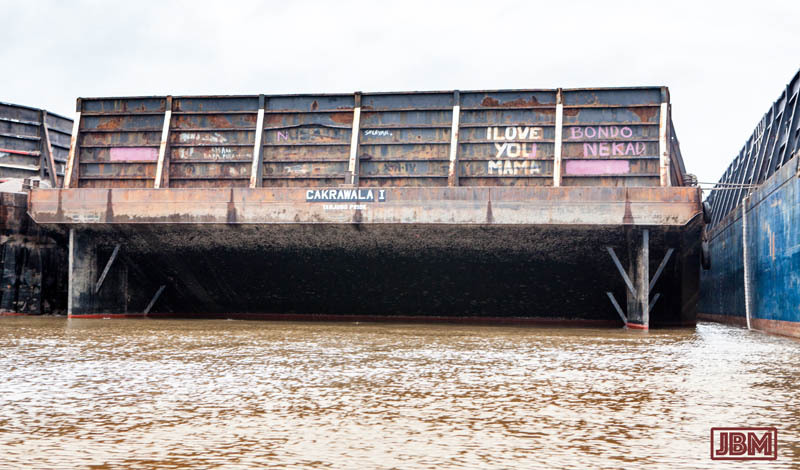 These barges are big. 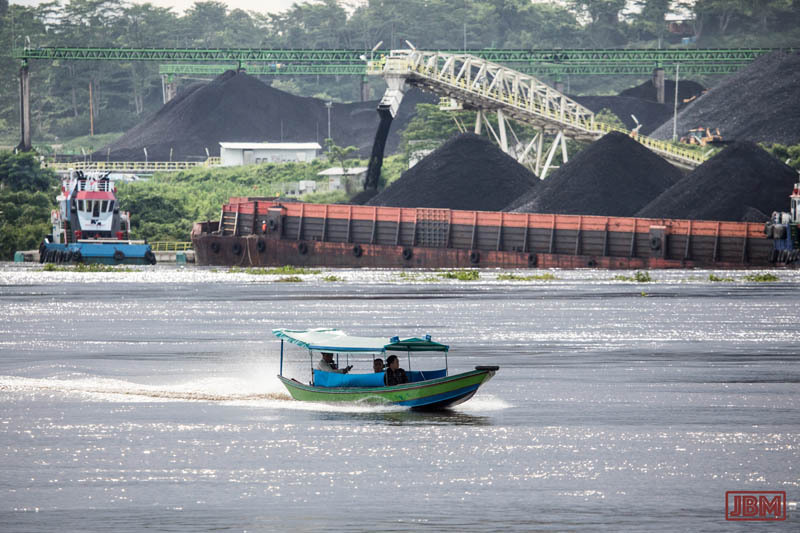 Upriver (upstream of the Mahakam Lakes) they can ‘only’ manage a load of 5000 tonnes, but the downstream barges may carry 7-8,000 tonnes of coal. 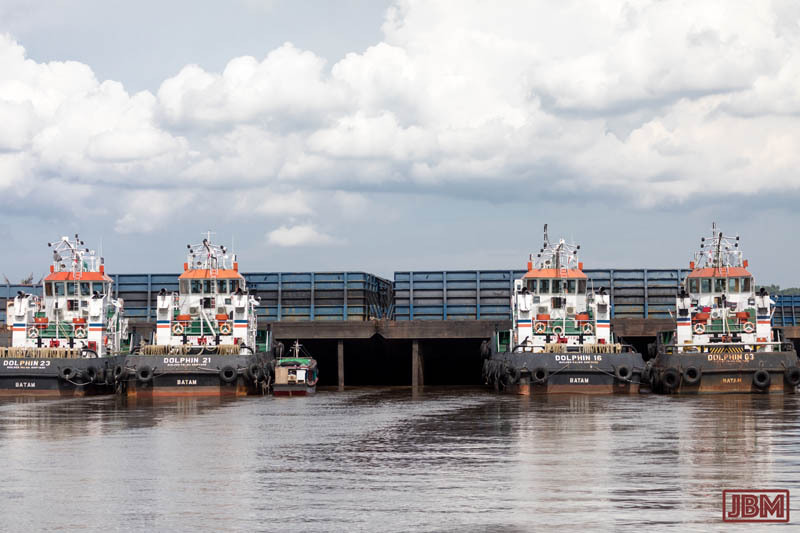 The content of each barge gets loaded onto ocean-going freighters – near the river mouth, at offshore transfer stations, or at the port down here in Balikpapan. Some even gets towed across the Java Sea to Surabaya for local (Indonesian) use, but most is exported – primarily to China, India, Japan and Korea. 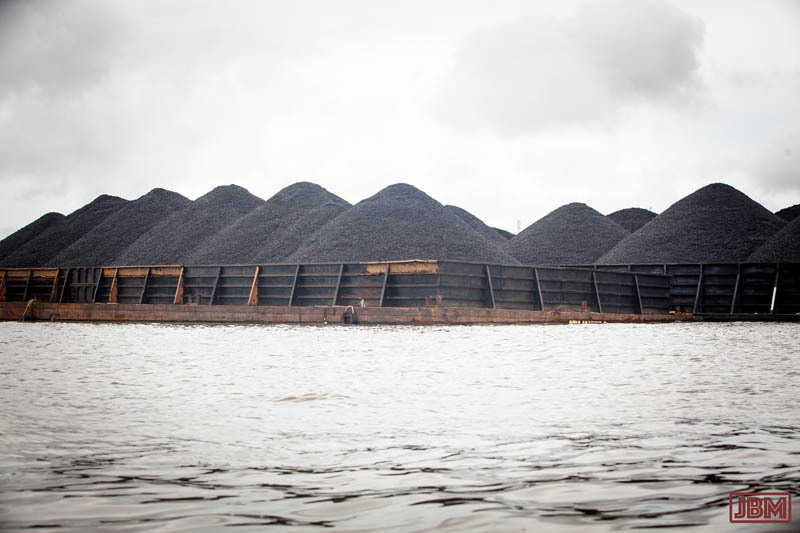 There are dozens of active (and many inactive…) coal mines in the Mahakam basin, often many kilometres distant from the river. The economic benefits of the industry to the local economy are substantial, but the environmental cost is huge. 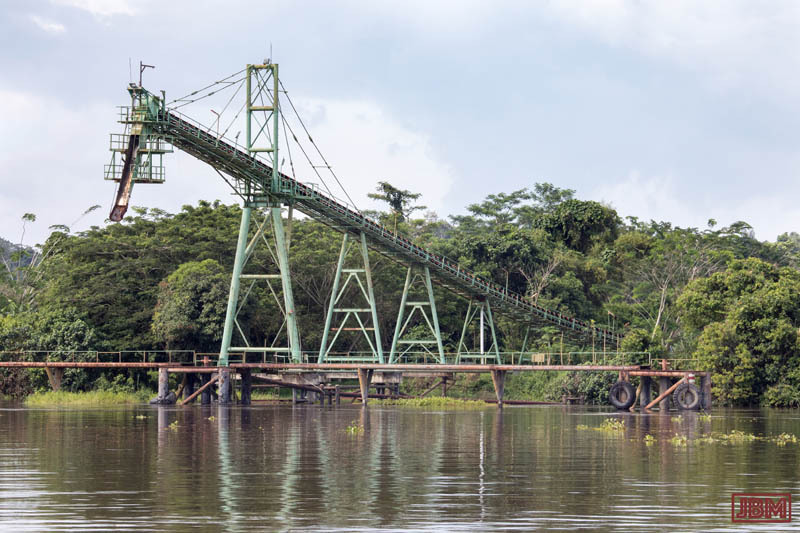 Apart from pumping carbon into the atmosphere when the coal is eventually burnt, the mines themselves scar the landscape, and leaching and leakage contributes the very high levels of heavy metals (cadmium, copper, lead etc) contamination of the once-pristine river. And in its fish, and in those who eat them. 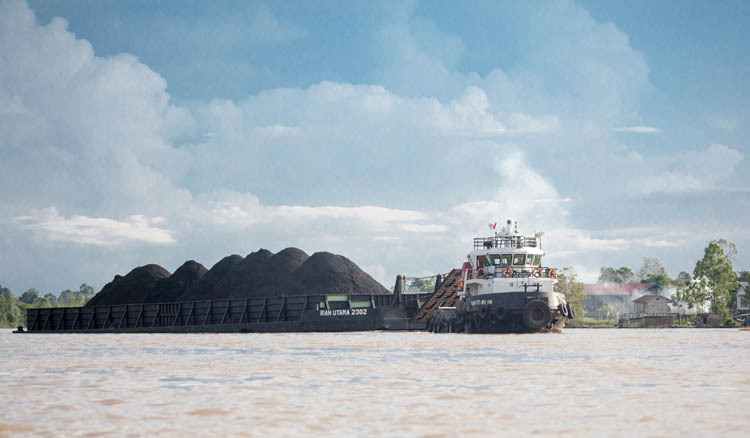 But in 2017, Mahakam coal and oil (the latter industry based around Balikpapan) remain the mainstays of the East Kalimantan economy (although palm oil is of course also big…). Even a moderate drop in the price of ore (as has happened in recent years) leads to the closure of many marginal extraction operations, bankruptcy for small operators, and the inability (or unwillingness) of many companies to fulfil their obligations to remediate the environmental damage they have caused. 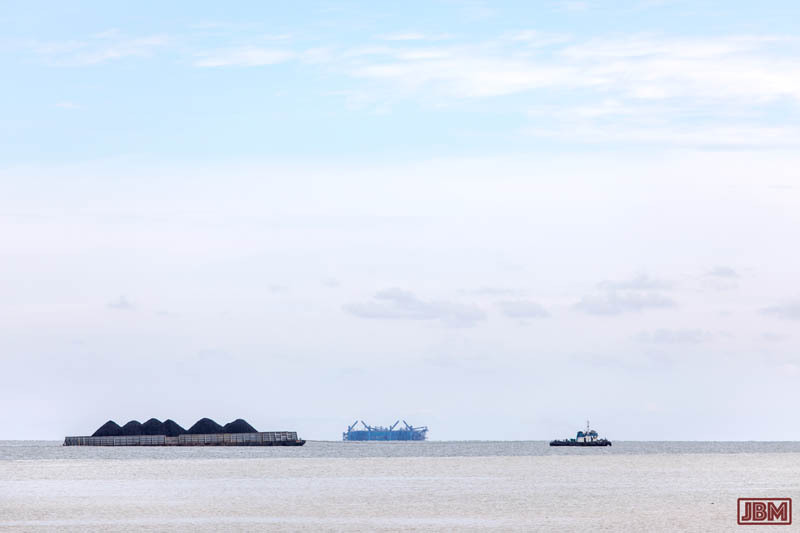 Barges can always be seen heading south down the coast at Balikpapan. From the shore, they could easily be mistaken for little black islands. 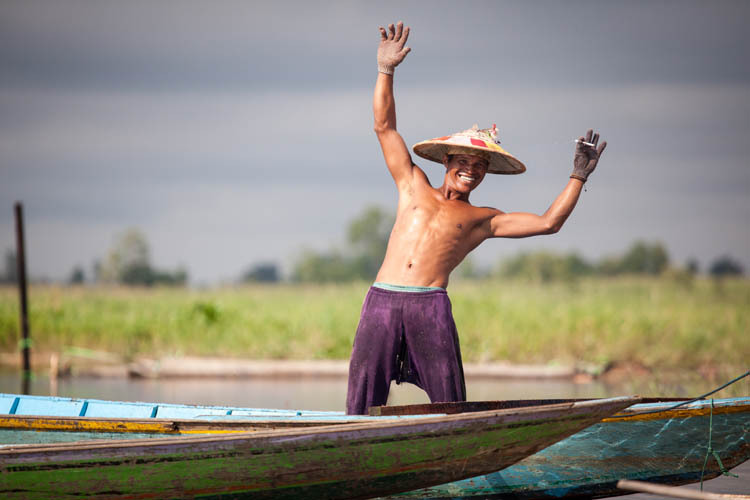 Here’s a followup to the previous post about the Mahakam River in East Kalimantan, but this time focussing on just one part – the wonderful Mahakam Lakes. 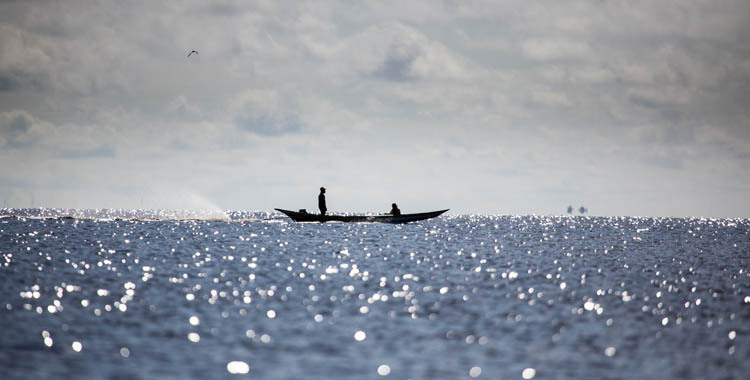 The Mahakam Lakes region is a complex of wetlands including some 32 lakes, three of which (Jempang, Semayang and Melintang) are large – each more than 100 sq km in size. All up the wetlands cover over 8,000 sq km, but much of this only gets inundated during the wet season. 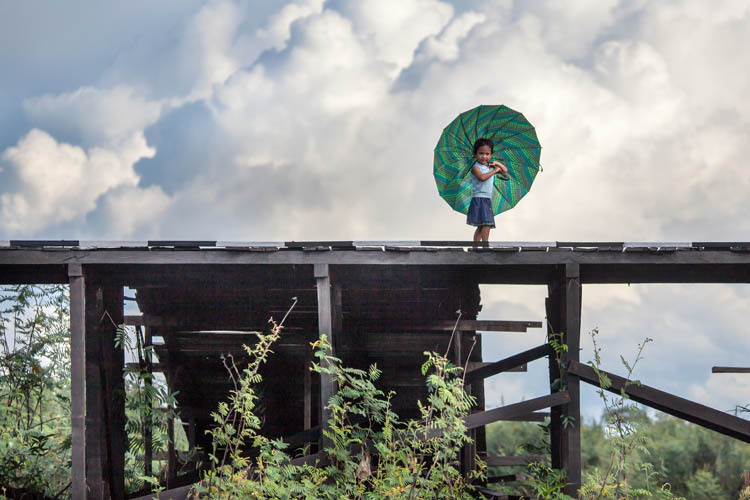 There are nine major villages and a population of around 15,000 people – Kutai, Dayak Benuaq, Banjar (who have moved up from Nagara in South Kalimantan), and other communities. The landscape looks and feels a lot like the Lake Sentarum region in West Kalimantan, (which we visited in April). 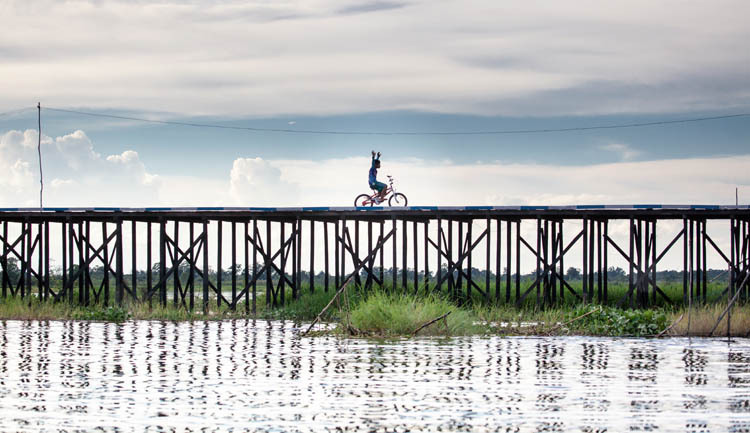 We were there late in the wet season, when the water levels are still high, so most of the villages can only be accessed by longboat. On the smooth waters with a small outboard motor whirring away behind you, it’s an extremely pleasant way to travel, and there are always interesting sights along the way. In most of the villages, like Jantur pictured above, the houses and roads are built entirely on wooden platforms standing on wooden stilts. 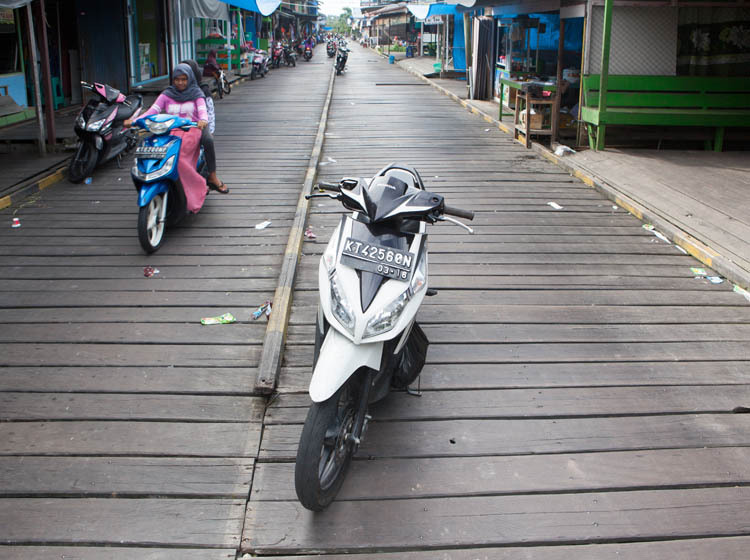 In Muara Muntai (above), the arrival of a motorbike is preceded by a clattering sound as the tyres rattle the boards underneath. 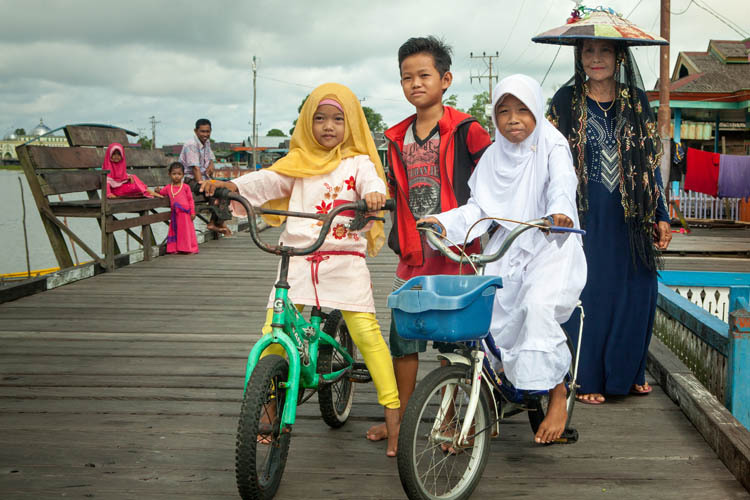 Life ‘on the boards’ goes on as it would on any Indonesian streets. People promenade, carry loads to and fro, sit and watch the world go by, and kids ride their bikes and fly their kites. We thought we had time to walk the length of Jantur village, but it is longer than we at first realised, and we made very slow progress as we had to stop, exchange pleasantries and explain ourselves to everyone that we encountered along the way. One problem with living amongst all that lovely timber is that fires are common, and often devastating in impact. (We have seen this before at Flamboyan in our ‘home town’ of Palangkaraya). 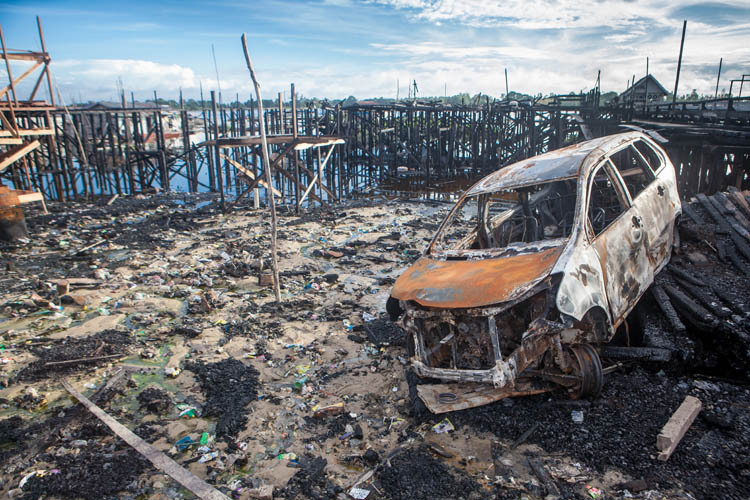 The fire in the village of Tanjung Isuy (above) happened a month before our arrival, and destroyed many of the buildings and jetties fronting the lake. They somehow managed to contain it before the whole village was burnt. 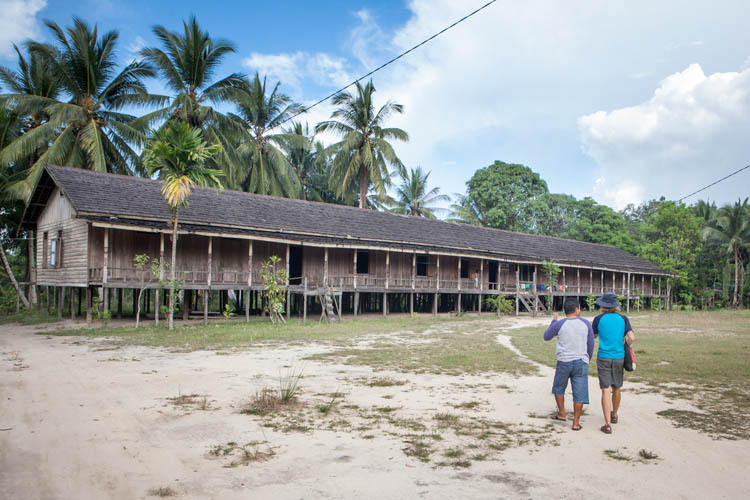 Nowadays, living in longhouses (rumah panjang, betang in Central Kalimantan or lamin in East Kalimantan) is uncommon – though we saw many longhouses, including new ones, in West Kalimantan. This one above is fairly new, so it is built more for convenience than for protection. 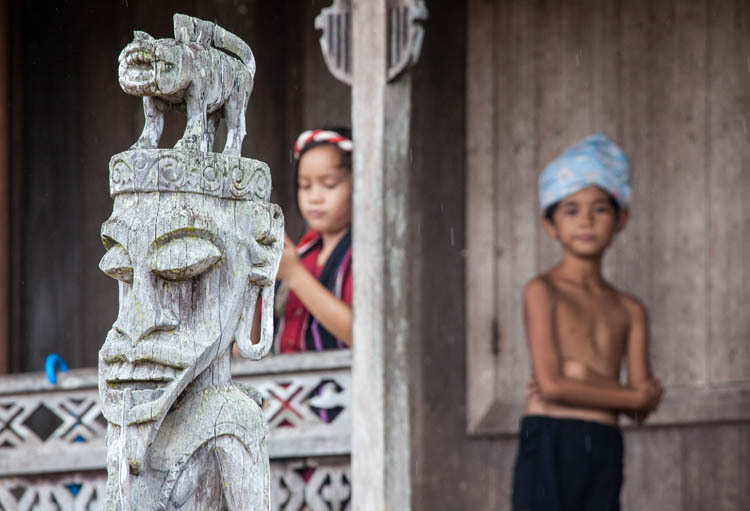 The older style of rumah betang are elevated four or five metres up, with retractable access steps, so that the occupants are safe from predatory animals and raids from enemy tribes. Inside there is (as always) a long open communal area, and doorways into the private quarters of each of the families. This one is about a ’12 door’ longhouse – meaning that 12 families share the building. 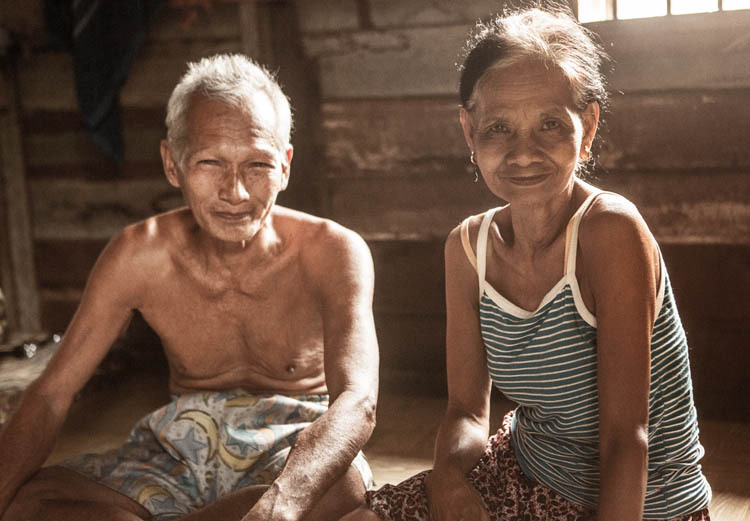 Pak Jayo and his wife Bu Panis live in dusun Panaat Bura, on the outskirts of Tanjung Isuy. 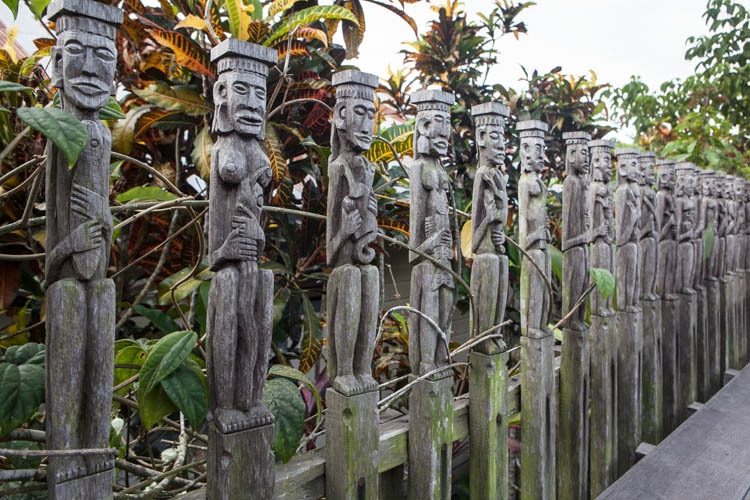 Their home is surrounded by dozens (maybe hundreds) of wooden figures that he has carved. There are gardens containing (amongst many other herbs, fruit and vegetables) the Doyo plant, whose fibrous leaves are used to make the ulap doyo cloth which is unique to the Dayak Benuaq people of this area. They warmly welcomed us and showed us around the house and garden. They make a range of handcraft goods for sale to visitors, though their Visitors Book showed the most recent guests were more than a month previously. I bought a bikini ha necklace strung with boar’s teeth and a kind of wood that will make me invisible to my enemies. You never know when that might come in handy. In Tanjung Isuy we arranged (i.e. paid for) a traditional dance performance one night. It was a mostly disappointing and perfunctory performance, because many of the dancers had been called to a special service at the local church, and those who did show up were perhaps not the most skilled of dancers. One dance was however very interesting. It told the story of a young girl who became very ill after being visited by malign spirits (above). Her mother despaired and moaned, and a ritual healer (a balian or perhaps a basir) was summoned to exorcise the spirits that had put the bad spell on her. Happily, his chanting and dancing worked like a charm (which in fact it was), and there was a short and joyous finale. 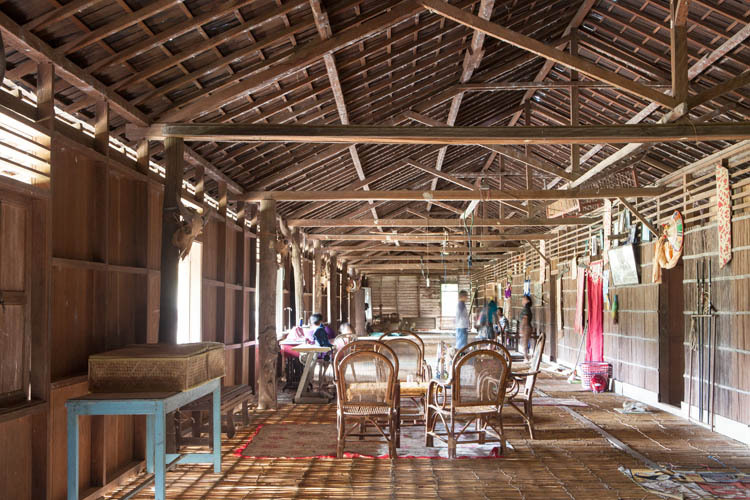 The new (2013) longhouse at Mancong village is an impressive two-storey affair, and it functions as a cultural centre rather than as a residential building. 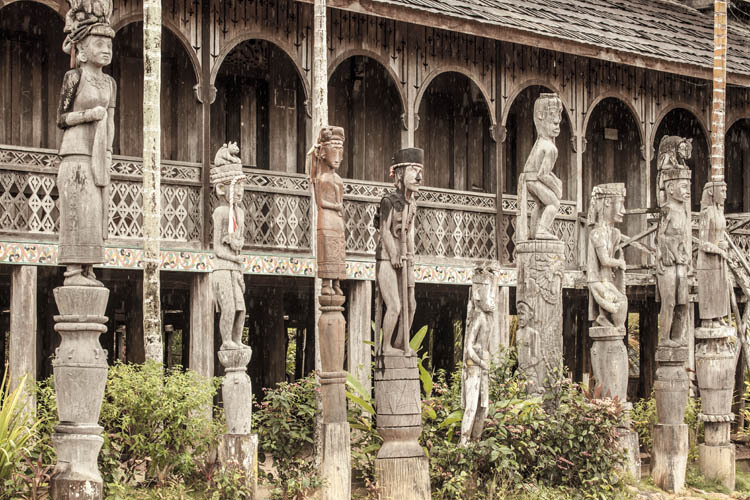 It sports a large number of carved wooden patung belongtang out front. These are normally built as the place to tether buffalo and cattle to be sacrificed during the tiwah funeral ceremonies – but these ones were more likely built solely for ornamentation. Either way they were impressive. Note that all of the figures are standing on stylised ceramic jars – these are the balanga after which the Palangkaraya Museum (where Karen is working) is named. 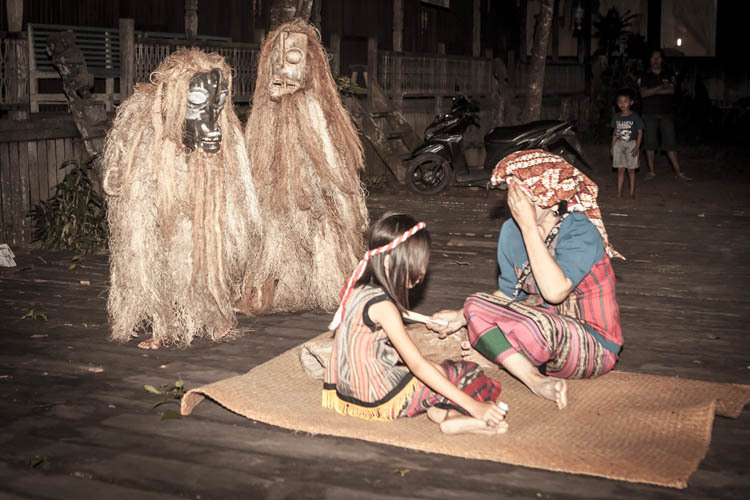 A traditional dance performance was under way inside the longhouse, and these children were waiting outside for their turn to perform. Nice cultural juxtaposition: the girl was texting friends on her handphone while she waited. 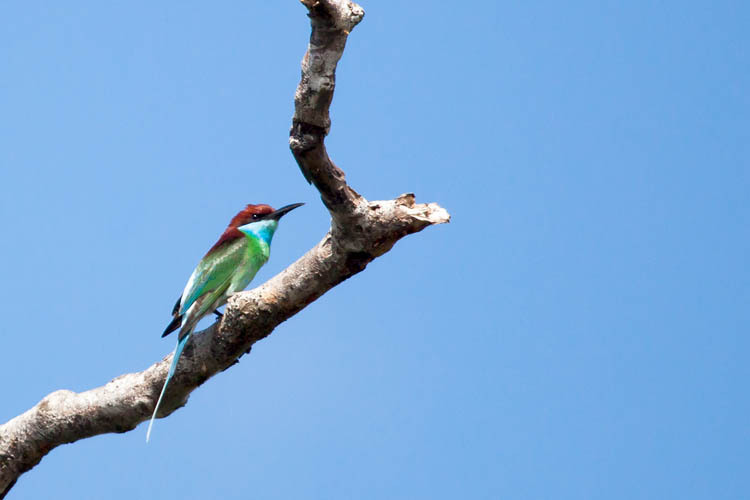 The bird above is a Blue-throated Bee-eater (Merops viridis [L], Kirik-kirik Biru [I]). Yes, it eats bees (and other flying stinging things), catching them in flight and carefully squeezing out the venom before eating. For some reason it (reportedly) ignores insects which are not in flight. 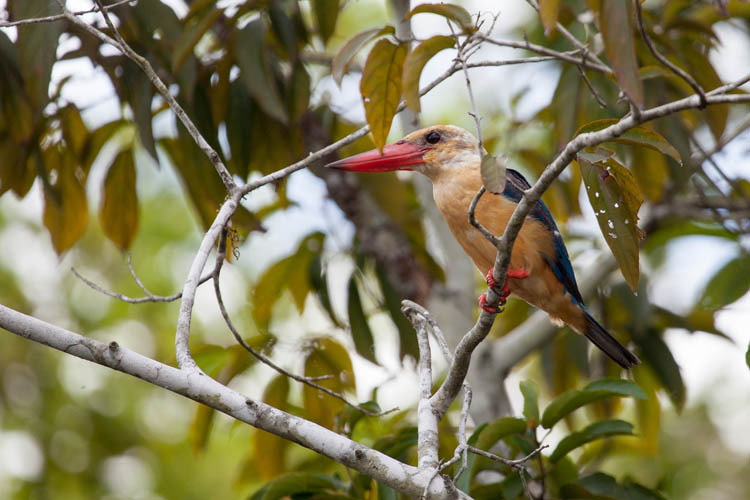 Stork-billed Kingfisher (Pelargopsis capensis [L], Pekaka emas [I]) This bird is listed as ‘uncommon but widespread’ (being found from India to Indonesia). 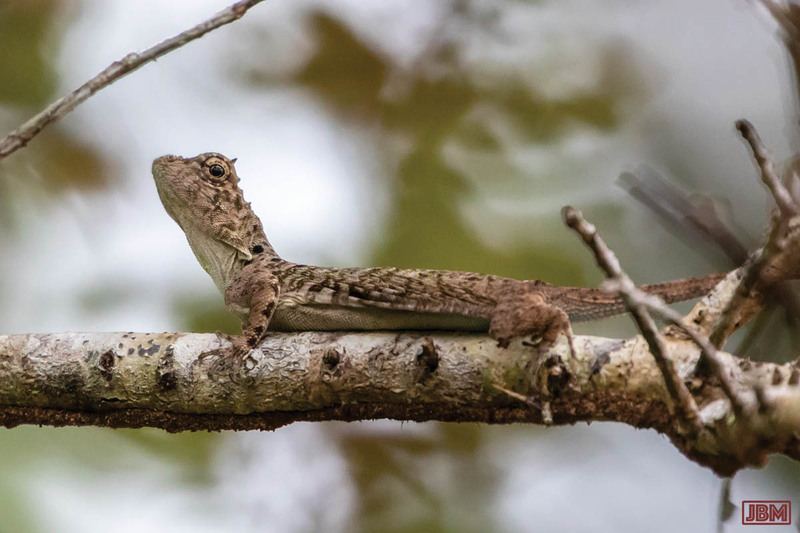 It lives in forested areas near tropical rivers and lakes, and so its biggest threat is habitat loss. 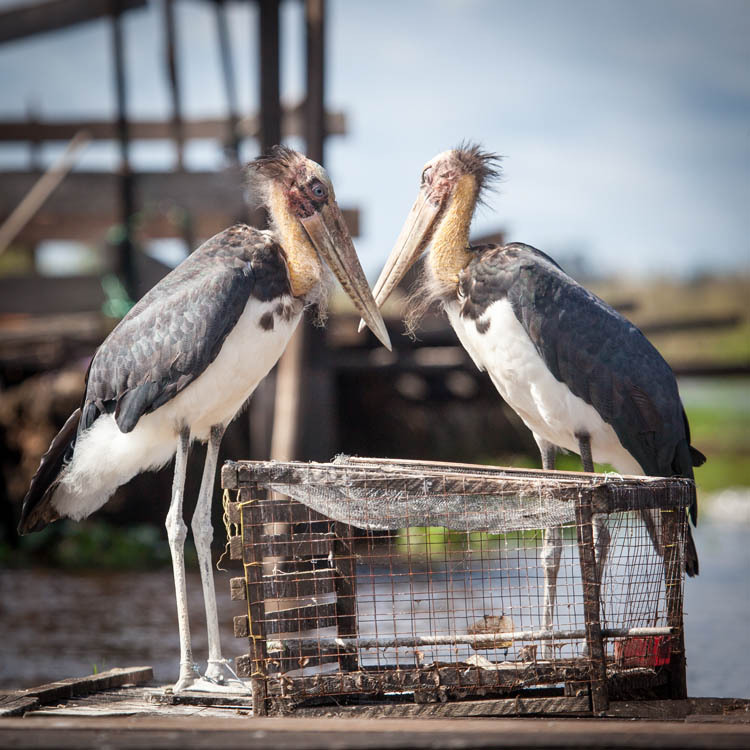 A pair of Lesser Adjutants (Leptoptilos javanicus [L], Bangau Tontong [I]) in Peregik village. These are big storks, more than a metre tall, and called adjutants because of their ‘military gait’ and habit of standing at attention for long periods. 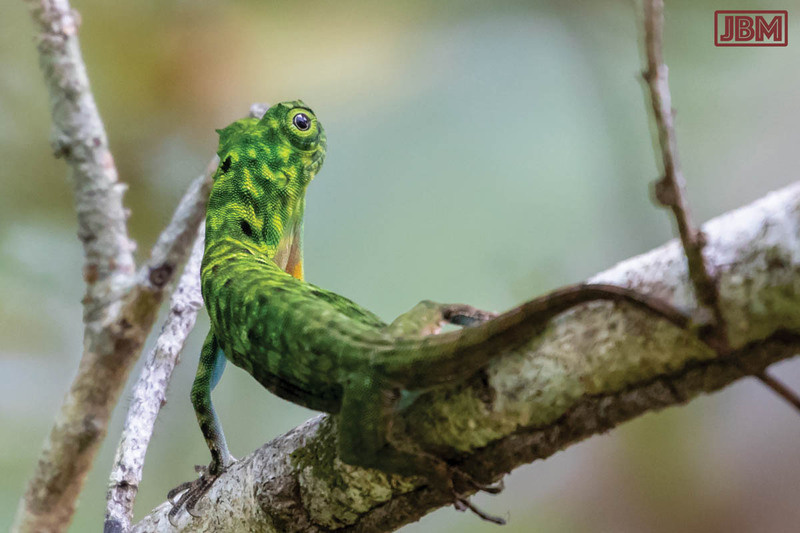 They are found in isolated communities from India to Indonesia, and a wild population does exist on the Mahakam. 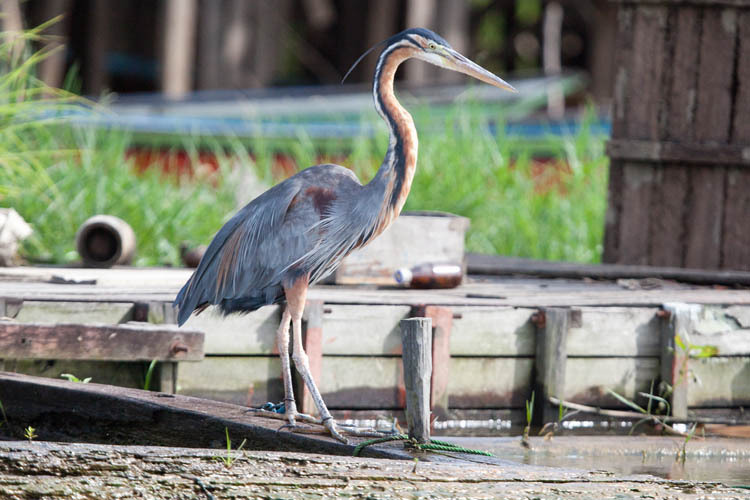 Purple Heron (Ardea purpurea manilensis [L], Cangak Merah [I]) in Melintang village. 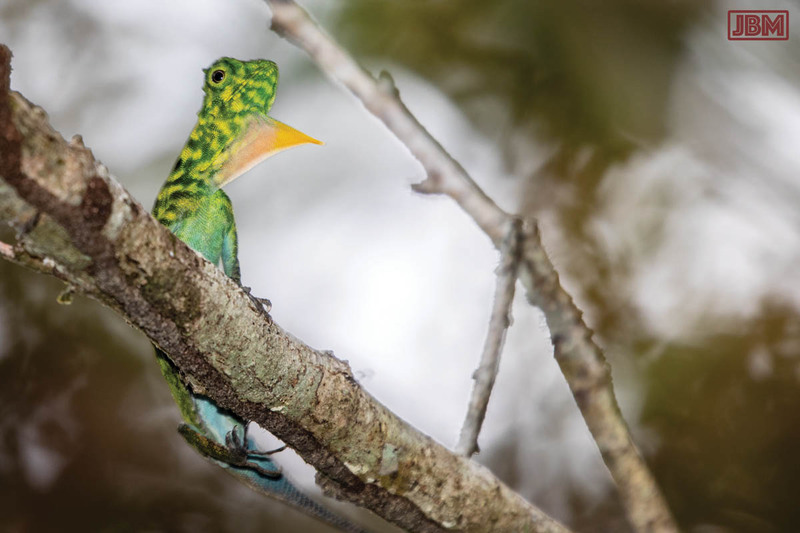 Like the Lesser Adjutants of Peregik village, this is a captive bird, though wild populations do also exist in the area. 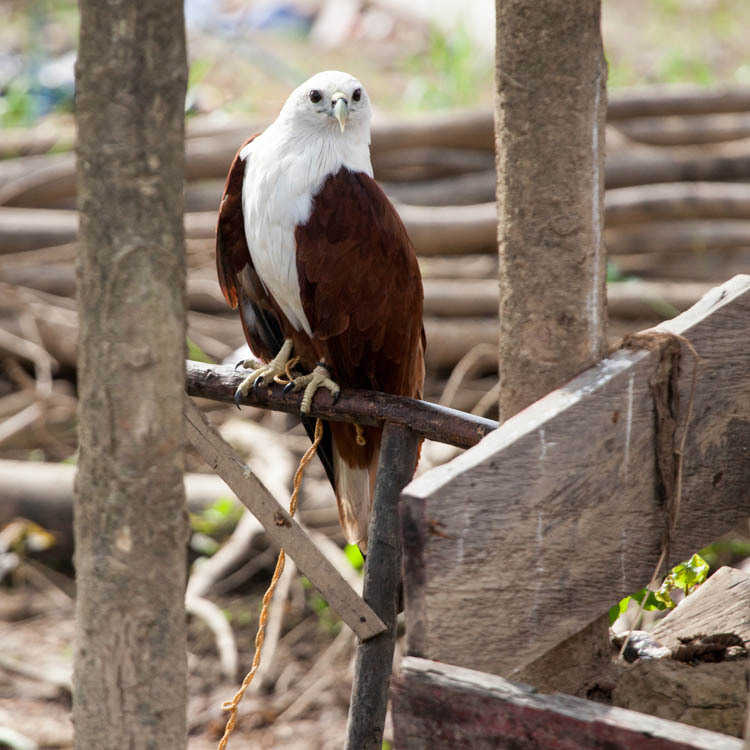 Another captive, this time a Brahminy Kite (Haliastur indus [L], Elang Bondol [I]) seen in Muara Muntai village. He looks healthy enough – but surely she (or he) can’t be happy to be restrained like that? Bird trivia: the Brahminy Kite is the mascot of Jakarta city, and is regarded as sacred (and a manifestation of Singalang burung no less) by the Dayak Iban of West Kalimantan and Sarawak. Finally, and almost inevitably, we were invited to a wedding reception (we think that makes eight now). This one was in Muara Muntai village. 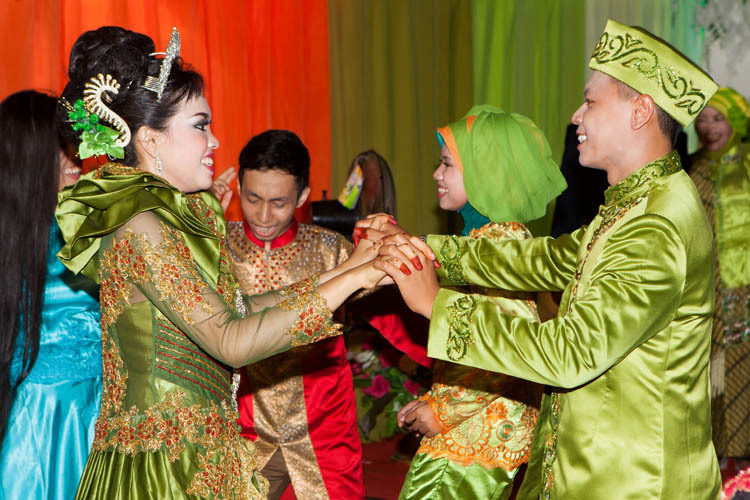 The bride, groom, and close family members were all resplendent in their shiny green and gold outfits. There was a very polished band playing well-known Indonesian pop songs, and lots of dancing. One interesting thing was that, apart from the groom’s one dance pictured above, none of the male guests danced. There were however two guys dressed in red and gold who came with the band, and they did dance performances throughout the reception, sort of like male go-go dancers. 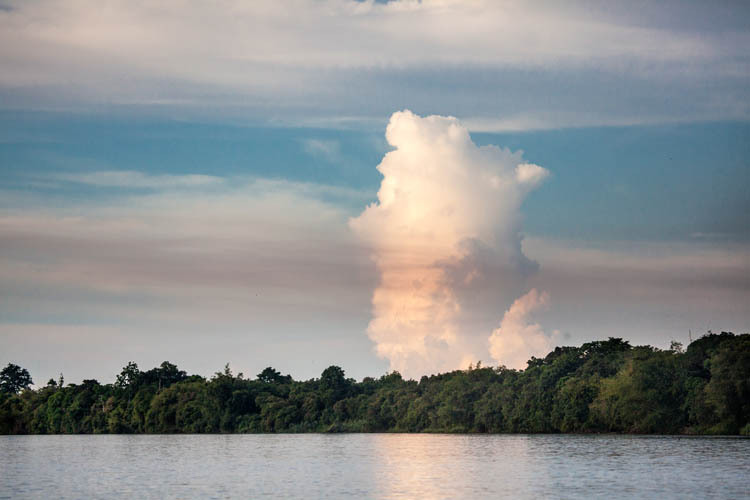 The Mahakam River runs for just under 1000km from the Muller Mountains in the ‘Heart of Borneo’ southeast to the provincial capital of East Kalimantan (Samarinda) and the coastal delta, eventually discharging into the Makassar Strait. It’s very wide and muddy in its lower reaches, and narrow, almost fresh and punctuated by rapids nearer the headwaters. The Mahakam Lakes, an extensive region of shallow freshwater lakes, some only existing during the wet season, sit near the middle. On the map it may not appear that we got far in those ten days. But it’s not an area that can (or should) be rushed – and the logistics of getting around can be complicated. Six hours on local buses to get from Balikpapan to Kota Bangun, three days on motor-powered longboats to explore the Mahakam Lakes, then 41 hours on a local passenger/freight boat to reach Long Bagun, around 14 hours on three speedboats to get up the rapids to Tiong Ohong and back again, and a final all-night car trip (with eight of us in the car) to get back to Balikpapan. But we enjoyed the challenge of organising it all as we went along, and it all came together rather nicely. Our longest single stretch of travel was on a ‘kapal biasa’, the main passenger and freight vessels on the river. 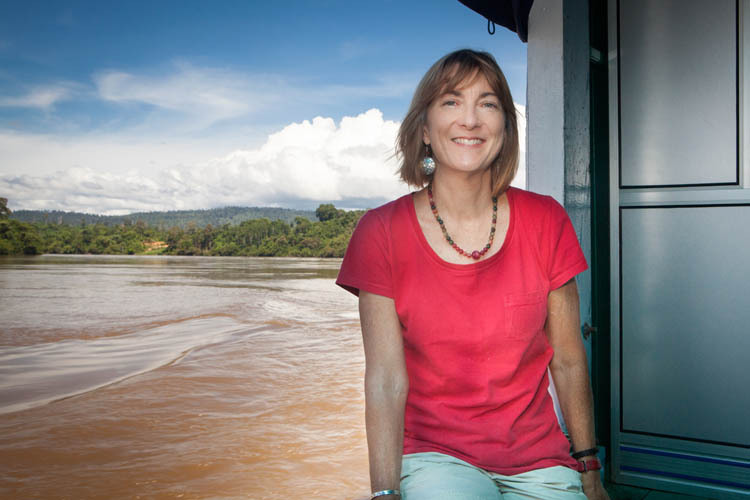 We spent 41 hours on board, delayed when the spotlight at the front of the boat stopped working, which meant that we could no longer travel at night for fear of colliding with the many large logs floating in the river. We slept on a platform upstairs, where there are spaces for 76 passengers, though thankfully it wasn’t full. Downstairs is crammed with cargo goods being delivered to the many villages along the way, and also with those passengers who couldn’t afford the $25 fare to travel in ‘luxury’ up top. We really enjoyed the journey, spending much of our time sitting on a little platform up front from where we could watch the river, villages, forest and other vessels pass by. 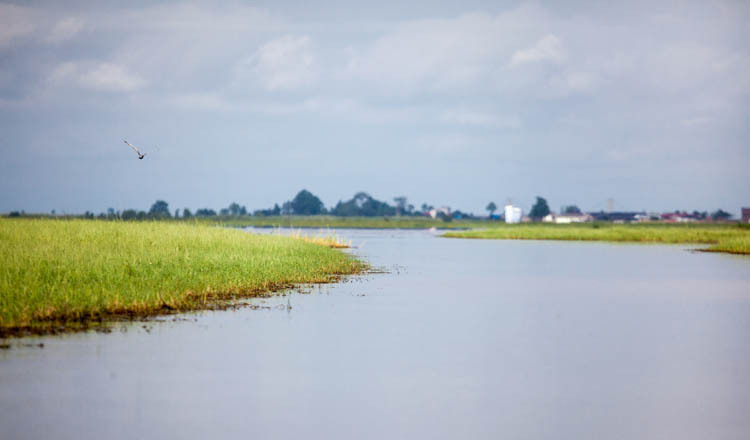 The river meanders continuously, the boat moved slowly with many stops, and the steady hum of the engines made for relaxing and contemplative travel. However the facilities were somewhat basic. The shared ‘bathrooms’ have less floor area than a phone booth, with a big hole in the timber floor which doubles as the toilet and as the means of bathing. The latter is achieved by repeatedly lowering a small bucket-on-a-rope down into the river below to fetch pails of coffee-coloured fast moving water below with which to wash.
As always there were many people keen to wave to us as we passed, none more exuberantly than this guy who looked resplendent in his typical Kutai-style hat, cigarette in gloved hand. He was one of a team working at a timber mill which was mounted on a floating platform in the river. There are plantations (mostly rubber and oil palm) and gardens, but for most of the journey the banks were a wall of forest. Almost none of it is ‘primary’ (undisturbed) forest, with all of the accessible and high-value trees having been removed long ago. It’s still beautiful, with big trees standing defiantly amongst the smaller trees, vines and regrowth. Bands of monkeys (mainly long-tailed macaques) lurk on the branches. But logging (along with coal mining) is still the major industry up-river. The trees are usually felled some distance from the river, and brought by truck down rough forestry tracks to the river. 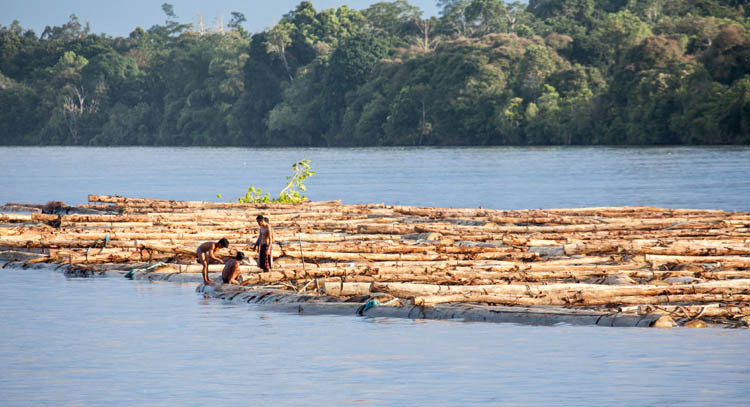 There is no road to the mills in Samarinda, hundreds of kilometres downstream, so the logs are transported down the river. 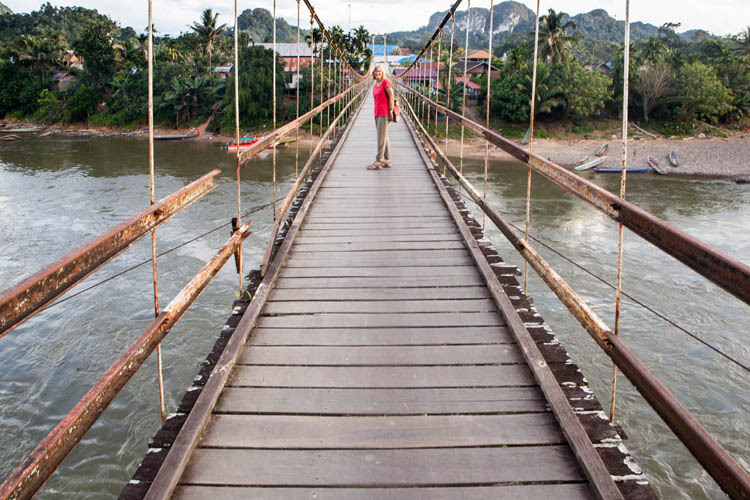 Once in the river, big rafts of timber are constructed by tying logs together with rattan and rope. These rafts can be a hundred metres or more from end to end, and it takes several days to journey to the mills. One or two little boats are used to pull and guide them, and a small team of men ensure that the raft stays tied together. These guys have great balance – falling between two logs could be nasty – and they seem to spend nearly as much time in the river as on it. 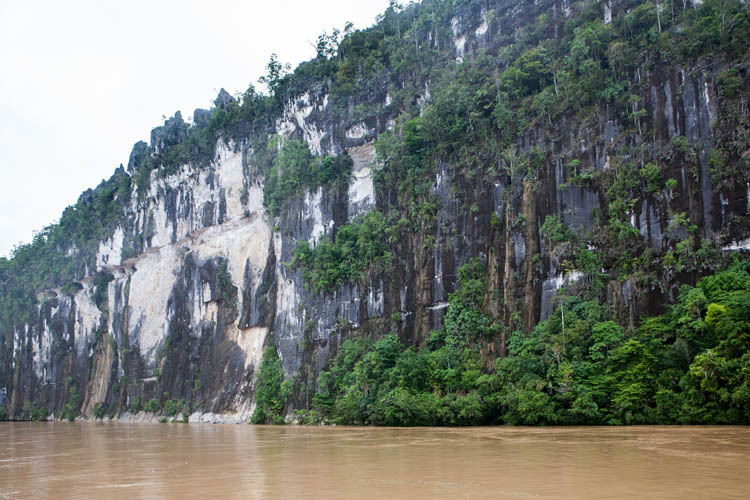 Riverside cliffs downstream from Long Bagun. We stayed in Long Bagun village, where the kapal biasa terminates before the rapids upstream. As always, we met lots of interesting and friendly people. Traditional tattoos are still common, and the guy on the left above sported some of the finest dayak motifs we have seen. He seemed a little fearsome at first, until we read the tattoo across his chest which says (in English, a language he doesn’t speak!) “Love my Family”. The bloke in the middle was putting the finishing carving touches to a pair of wooden statues to adorn the front entrance of his home. 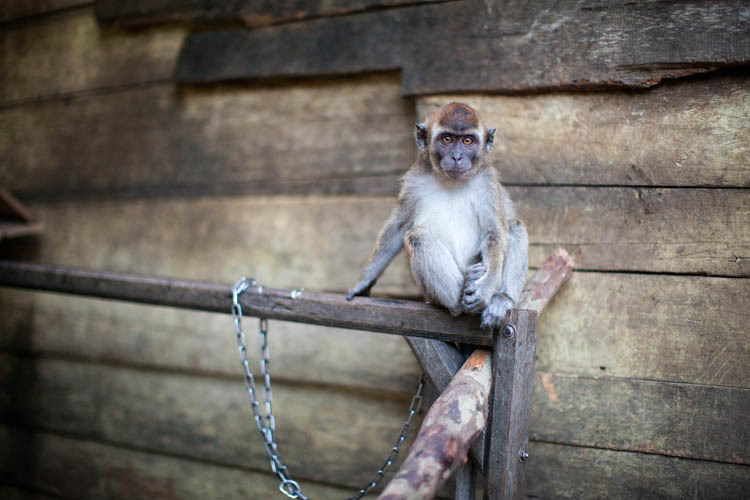 (He also keeps a angry little pet monkey on a chain, which launched itself at Karen when she got close.) We met the couple on the right as they began their wedding ceremonies by visiting the homes of all of their family members in the village. The last village we stayed in was Tiong Ohong. The six hour speedboat journey there from Long Bagun was sensational, negotiating several rapids, through deep gorges and deep forest. The rapids were pretty exciting, particularly after we were told about the boat that capsized a few months previously with the loss of three lives. We were quite happy to put on the bulky lifejackets offered to us. Tiong Ohong is actually two villages, (Tiong Ohong and Tiong Bu’u) facing each other across the river, with a suspension bridge connecting them. You cling to the side rail when motorbikes cross over. 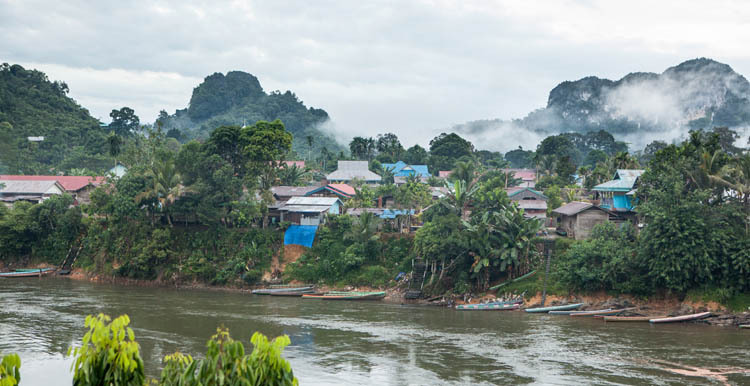 The village is also the base for the seven day ‘Trans-Kalimantan Trek’, a very tough wet trudge through jungle and over the Muller Mountains to the Kapuas River in West Kalimantan. 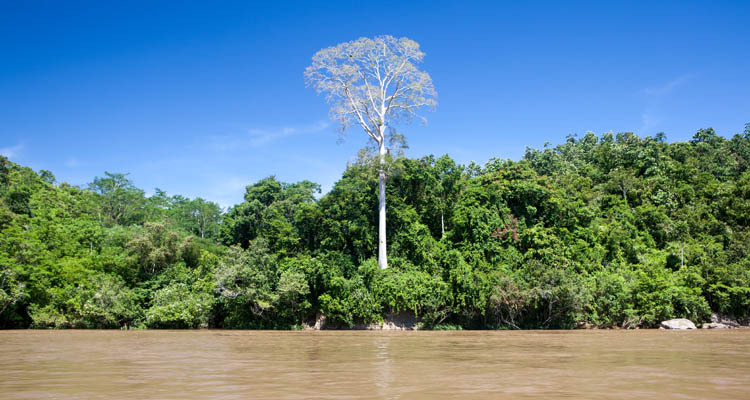 Mud, leeches, spiky vines and dozens of river crossings. People who have done the trek express ‘grim satisfaction’ on completion, and we are yet to find reports of anyone actually enjoying it. But we stayed on the river, returning from Tiong Ohong to Balikpapan over the following two days, and we enjoyed every minute of it.